(HOST) This week, as part of VPR’s special Champlain 400 programming, commentator Mike Martin is looking through the "Eyes of Champlain." On Wedneasday he considers Champlain’s views about the various cultures he encountered in the New World. (MARTIN) Modern readers of Samuel de Champlain might be shocked by the fact he calls Native Americans "sauvages" or savages. But the word "sauvage" in Old French comes from the Latin "silva" for forest, making the term mean something like "forest dweller." And we must remember that the peoples of the New World fascinated many Europeans who believed them to be uncorrupted by European civilization: Montaigne claimed that nothing was more barbaric than the Inquisition; Dryden coined the term "Noble Savage"; and later Rousseau described a "natural man" living in harmony with nature and untainted by greed. So it’s important to understand that Champlain lived when many Europeans still held a romantic view of Native Americans, back before 19th century notions of race and colonialism poisoned our concept of culture. 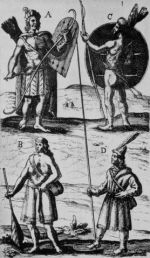 In his book Des Sauvages, or On Savages, and in his Voyages, Champlain describes Native American customs and practices much as an ethnographer would. He says of a winter spent amongst the Huron that he had the "…leisure to study their country, their mores, their customs, their lifestyle, and the form of their assemblies." And as Champlain visits different indigenous peoples, he describes burial rites, courtship, and clothing in a largely respectful, objective style. He admires their organized hunts as well as inventions such as corn leaf diapers and snowshoes, which he names raquettes. Unfortunately, he doesn’t care much for the local cuisine. He describes the dish Migan, sometimes made with undressed fish – bones, scales and all – as mal odorante, or "smelly." And he especially doesn’t care for the bled d’Inde, or Indian corn, that is prepared by rotting in the mud for a few months. Champlain claims nothing smells worse when it’s dug up. Champlain also recognizes that certain Native American practices are similar to European ones. He compares a twelve-step Huron dance to the trioly of Brittany. He finds the men’s hairstyles of the cheveux-relevés, of the Odawa nation, to be better than those of some French courtiers and compares a Montagnais chief’s oratory skills to those of Aristotle and Cicero. The fact that Champlain admires many Native Americans, and compares their cultures to his own, undercuts any notion that he held a strictly racist view of their peoples. And Champlain’s interaction with the indigenous peoples shows a great deal of respect for them. He differentiates between the many cultures he encounters, describing each not as a "tribe" but as a separate "nation." He treats their leaders as heads of state, and details the diplomatic gestures that are undertaken when he meets with them. If Champlain were around today, I can easily imagine him suggesting that we might understand aboriginal nations better if – instead of using the amalgam "Native American" – we learn to know them as the Atirhagenrat, the Sonnontouan, the Mi’kmaq, and so on. All this week, as part of VPR’s special Champlain 400 programming, commentator Mike Martin has been looking at the New World through the "Eyes of Champlain." Today, he offers a brief glimpse of the man himself. This week, as part of VPR’s special Champlain 400 programming, commentator Mike Martin is looking through the "Eyes of Champlain." Today, he considers Champlain’s attitudes about torture and the humane treatment of prisoners.